Hayate No Gotoku 4 – Is the Steam Starting to Run Out? Hmm. I think the humor train is starting to finally sputter at last, as this episode wasn’t as riproaringly funny as the last ones–considerably less so. And it seems to be mostly because of something that I feared might happen (see my first review)–the self-aware jokes are starting to grate and feel tacked on. First up is the talking white tiger. I have to confess I thought his introduction in the previous episode was jarring and, for some reason, felt extraneous. This is even though the show had been busy breaking all kinds of rules already, and to be honest I can’t quite explain why. The opening joke of this episode does partially redeem him because the Pokemon jokes were, in fact, awfully funny. (It was perhaps the funniest moment in the entire episode! Plus I’m still not tired of the bleeping out of brand names.) 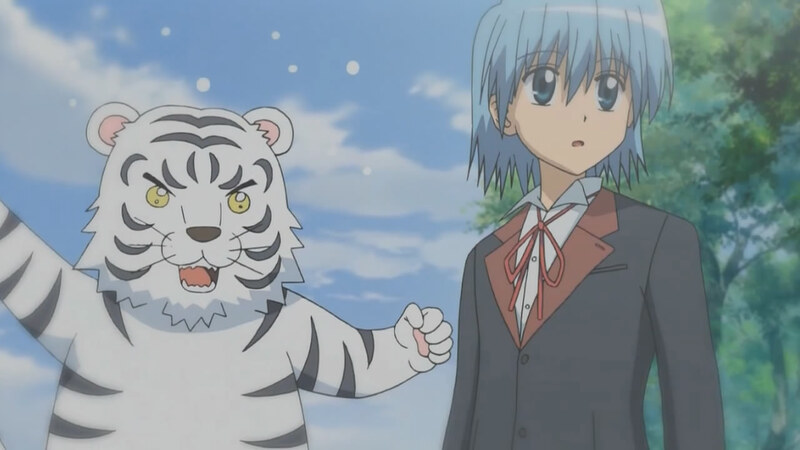 Though if what the tiger says is right and they really do intend to make him a mascot character…he had better be as funny as that teddy bear in Bleach or he’s going to turn old hat faster than even the narrator…who was, interestingly enough, much less present in this episode than in previous ones. To my relief. 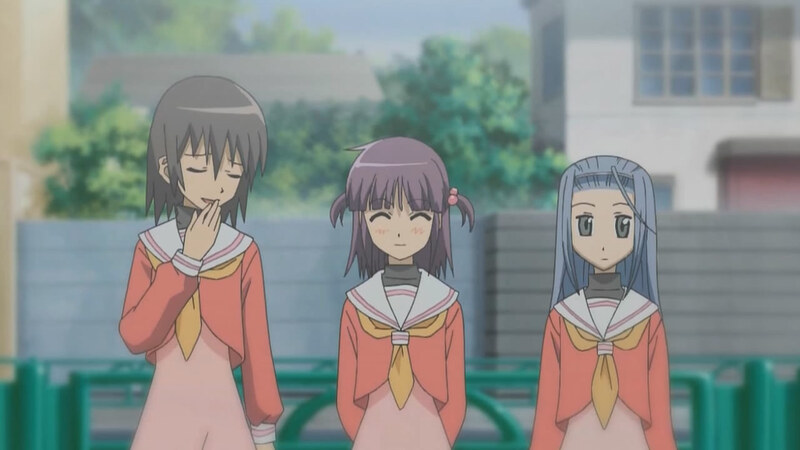 I think the one joke that sums up why I felt this episode didn’t work that well is the introduction of the trio of high school girls. At first, given the large number of adolescent girls who show up at the school in this episode, I was expecting a harem comedy parody (which seem to be in the cards for the next episode, actually). And indeed, the three girls seem to fit the harem archetypes. What went wrong was when they literally introduced themselves to the audience, breaking the fourth wall by facing the camera and the characters commenting on “talking to the CRT” (which gets snickers for the outdated technology). Asides of course are nothing new in stagecraft, but this one really felt like it was just put in for its own sake, and barely even got a chuckle out of me. Another example of a failed “postmodern” joke is Nagi knowing the exact sequence of the previous events despite not being a witness. There is no explanation of how or why she would know such events–a funny explanation, no matter how implausible, would have worked a lot better. She just does. It’s quickly set aside, as if to mainly just break the rules of standard continuity. I dunno. 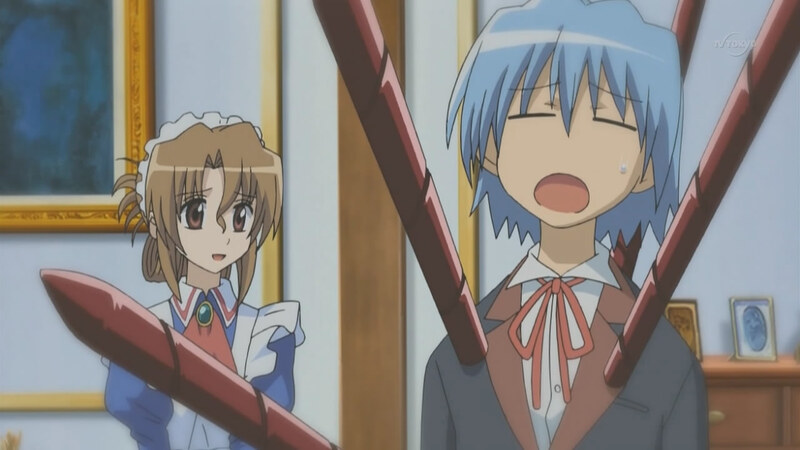 Hayate attracted me precisely because its layers of humor worked so beautifully well in the first few episodes. (The Eva references in the previous episode, for instance, were handled without drawing unnecessary attention to themselves. And am I thinking too parodically or did they miss the chance for both Ouran and Utena references in this episode?) Plus with the dramatically widened cast that this episode introduces–with the Student Council President and her sister taking the lead–I fear that the show will begin to sink into the rut that both Ouran and School Rumble did later in their runs: treading water because there’s too many characters and too few fresh comedic ideas, running on the fumes of an initially great premise. Well, it’s still early in the run and it may just be a hiccup before even greater things come. The next episode could be, I hope, a delightful skewering of the whole harem comedy genre. I can’t wait if it’s so! I think you missed something important: This particular episode wasn’t SUPPOSED to be purely comedic in nature, it’s an important character introduction one. How do we know? We get nearly no narrator parts at all, which means that whatever is depicted is intended to be just like this. Hayate has more to offer than just the comedic impact of the first episodes, and ep4 lays the groundwork for it. It will always retain the humor, but it will gain some more serious drama/romance aspects in the future, and here, Hinagiku will play a central role. Also note that they’re introducing 1-2 characters per episode: (Nagi/Hayate in ep1, Maria/Klaus in ep2, Tama in ep3), now we had Hinagiku/Yukiji/Triplet in ep4. Next episode will have Sakuya and Isumi. This is not because the author has no idea what to do with the existing cast anymore and feels the need to throw in more people, he’s simply placing more figures on the board for later use. You’ll see. You’re right of course that the “surprise factor” of the humor will wear off a bit – how could he not? Still, by this logic, it will be nearly impossible to find a comedy which stays 100% fresh all the time, unless it turns into an amorphous ever-changing mush. I prefer some consistency here. Ah, gotcha. Thanks for the additional info–I’m not familiar with the manga, so it’s good to know that there is definitely a story coming up where all the characters will play important roles. That’s very different then from School Rumble which is primarily a gag anime. I actually figured this was a reference to Akira from School Rumble, who does that a bunch of times in the series. The one standing out most in my memory is the one with Harima’s bathing suit catastrophe with Eri seeing him naked.